MARYINKA, Ukraine -- Though overshadowed by the war in Syria, fighting in eastern Ukraine has picked up sharply in recent weeks, residents along the front line, commanders and European monitors say. 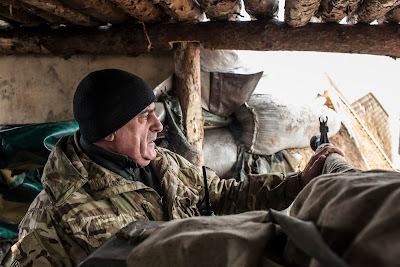 Lt. Col. Mikhailo M. Prokopiv, commander of Ukrainian Army forces in Maryinka, Ukraine, looked toward territory held by Russia-backed rebels on Sunday. The resumption of hostilities in Ukraine, with exchanges of machine gun and mortar fire across the front line now up to levels not seen since last summer, suggests a willingness by Russia, which supports the rebels in eastern Ukraine, to sustain two active conflicts at once. In late September, Russia began airstrikes in Syria on behalf of the government of President Bashar al-Assad. “A week ago, we had shelling every two to three days, and mostly at night,” Lt. Col. Mikhailo M. Prokopiv, the commander of Ukrainian Army troops in this town, said in an interview on Sunday while touring the front line in a jeep. Separatist militias have crept forward to carve new trenches within 150 yards of the army’s front line, he said, close enough for the soldiers and militiamen to yell insults back and forth. His positions now regularly come under fire from mortars and truck-mounted antiaircraft machine guns, lowered to fire horizontally, Colonel Prokopiv said. A sniper killed one of his soldiers on Saturday. Neither side has yet resorted to firing heavy artillery. For now, the shooting appears intended to “give us a little nightmare,” he said, to encourage Ukrainian politicians to carry out the stalled peace accord known as Minsk 2. Russia was drawn deeper into the Syrian conflict in November after Turkey shot down a Russian bomber that Turkey said had violated its airspace. Moscow sent more planes and a sophisticated air defense missile system to Syria. Alexander Hug, the deputy chief of the monitoring mission in eastern Ukraine for the Organization for Security and Cooperation in Europe, told journalists on Friday that observers last week saw 88 tanks on the pro-Russian side of the line. He did not specify their origin, and Russia has denied sending weapons to help the rebels. “They just sit there, armed and battle-ready, within easy reach of the contact line,” Mr. Hug said of the tanks. In Ukraine’s capital, Kiev, several hundred right-wing paramilitary veterans added to the government’s troubles by kicking off a protest over the weekend on the city’s Independence Square, known as the Maidan, demanding the ouster and trial of the country’s leaders. The men, who call themselves the Revolutionary Right Forces, pitched tents and milled about, but did not appear to have much popular backing.